The shine of Arsenal's season-opening 4-3 win is long gone, replaced by the sense of utter panic and anxiety that can only come from Arsenal losing a 1-0 game that they probably win nine times out of 10. As I said on Twitter as the loss to Stoke came to an end, "Indeed, we are 'doing this again'." The thing that was so frustrating about the loss at the Potteries was not that it happened or even how it happened. It was the fact that it almost felt inevitable. The fact that we've seen this exact loss so many times before. We've seen it before, we'll see it again. 77% possession doesn't win matches. So, we go into the final match before the first international break in 11th place. Win at Anfield and the fan base will be buoyed. Lose and we'll see some really weird opinions on social media. I know which of those futures I'd prefer to live through. How about you? For one of the first times ever that I can remember, the Arsenal team news largely consists of players who are available again, rather than players who are out. Exciting times! Alexis Sánchez should also make his first appearance of the season in an Arsenal jersey. Reports indicate that Manchester City are readying some sort of nominal bid before the transfer window closes, though they are pessimistic that such a bid would be accepted. You may have heard that Jack Wilshere was sent off from an Under-23s match on Monday, though that ban does not apply to first team games. It's not like we were going to see Wilshere on Sunday, anyway. It hasn't been mentioned much this summer, but with the transfer window closing before the next preview I feel I should mention that Joel Campbell is out with a long-term knee injury suffered on international duty this summer. Philippe Coutinho remains "out" with a "back problem" that has also been called "illness" and should remain out until his transfer saga ends. Barcelona lodged a fourth bid for the Brazilian playmaker this week, this one worth £138 million and all of the diamonds in Siberia. The fact that Liverpool have not sold has led to pundits taking the angle that the club is "serious about their ambitions" this season. Again, that's all down to #narrative. Adam Lallana suffered a thigh injury in early August that will keep him out for a few months. Nathaniel Clyne is most likely out as he rehabs a hamstring injury. Third-string goalkeeper Ádám Bogdán, whose name has more accent marks than I thought at first, is out with a serious knee injury. Predicted XI: Mignolet, Gomez, Matip, Klavan, Robertson, Wijnaldum, Henderson, Can, Mané, Firmino, Sturridge. Arsenal's form went from A-OK to A-O-The-Sky-Is-Falling in a single week, which sounds about right and isn't surprising at all. So, let's talk about Liverpool's form so far. On opening day, the Reds played a wild 3-3 draw at Watford in which Miguel Britos equalized late for the Hornets. A week later, Sadio Mané had the only goal in a 1-0 win over Crystal Palace. Meanwhile, Liverpool faced Hoffenheim in the Champions League playoff qualifier, winning 2-1 in Baden-Württemberg in the first leg and 4-2 at Anfield in the second. Now, Hoffenheim drop to the Europa League, where they lurk in Pot 3 to inevitably draw Arsenal. Liverpool won both meetings against Arsenal last season, which was a big component of their finishing fourth place to Arsenal's fifth by a single point in the league table. 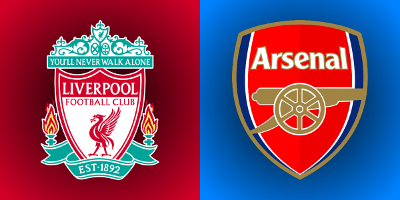 This will be the third year in a row in which Arsenal and Liverpool are meeting in the month of August, though their last two August meetings took place at the Emirates. Arsenal opened the season against Liverpool last year and, unlike this year's opening match, lost 4-3. Theo Walcott had an early penalty saved but opened the scoring in the 31st minute anyway. Philippe Coutinho hit an unstoppable free kick just before the break to equalize at halftime. Adam Lallana, Coutinho again, and Sadio Mané made Liverpool's lead 4-1 by the 63rd minute. Alex Oxlade-Chamberlain and Calum Chambers pulled goals back for the hosts, but Arsenal could not find the equalizer. At Anfield in February, Roberto Firmino put Liverpool up 1-0 on just nine minutes and Mané doubled the lead before halftime. Danny Welbeck pulled a goal back in the 57th minute, but again, Arsenal could not find the equalizer. Georginio Wijnaldum made it 3-1 in the 90th. The two clubs split their two league encounters the year before, meaning Arsenal have not beaten Liverpool in four tries, dating back to April 4, 2015. In that season, Liverpool snatched a late equalizer in their meeting at Anfield, meaning Arsenal have not beaten Liverpool at Anfield since September 2, 2012. The referee is West Yorkshire-based Martin Atkinson. Arsenal do not historically have a good record with Atkinson in the middle; for example, he was the referee for Arsenal's 3-1 loss at Stamford Bridge in which he allowed Chelsea's opening goal while Hector Bellerín was getting elbowed in the head. He also took charge of a 2-1 loss to Manchester City, as well as wins over Sunderland and West Ham. So, in total, a split for Arsenal in last year's four matches with Atkinson, though those two losses were each pretty damaging at the time. For Liverpool last year, Atkinson was in the middle for two league wins, over Chelsea at Stamford Bridge and Middlesbrough on the final day of the regular season, as well as a League Cup loss to Southampton. That match was the second leg of the semifinal; Southampton led the tie 1-0 already, but sealed it with a late Shane Long goal to win the match 1-0 and the tie 2-0. The Saints, of course, went on to lose the final to Manchester United. John Painting is a contributing writer to the Modern Gooner and a subdivision of musical set theory. You can follow him on Twitter @zorrocat for harmonic triads.